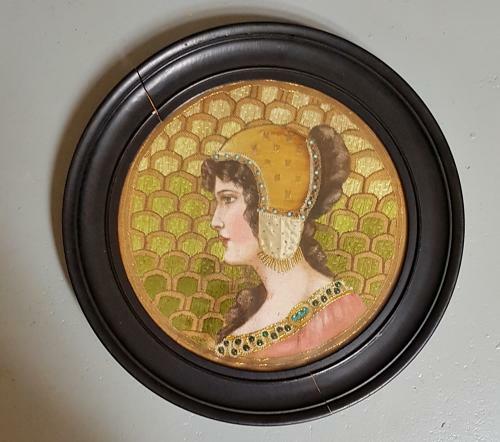 A lovely Arts & Crafts mixed media portrait roundel of a young Mucha style lady in its original ebonised frame; c1900. Intrinsically a glazed, painted embroidered needlework female side protrait design with additional bejewellement of what appears to be turquoise and other beadwork. The young lady is also wearing a velvet and silk head covering. Reminiscent of some of the (later) work of Mary Ireland. Approx 19.5" overall diameter inc frame; 14" visible diameter.